The Martini Shot features eight compelling portraits of lives touched by, and in some cases embedded in, crime. George Pelecanos provides unflinching insight into the cognizant and inadvertent decisions and actions that can derail lives, and shift a person from the straight-and-narrow to a darker path. There are no heroes and villains in this collection: just people, reacting to their circumstances in various ways, and suffering (or succeeding) because of it. The Confidential Informant involves a street-wise kid and his twisted desire to make his father proud. The plan he hatches to claim a $1,000 reward for information regarding a recent murder has devastating consequences; but the kid’s quest for redemption in the eyes of his father makes for enthralling reading, and proves to be one of the collection’s best. Chosen chronicles the lives of a Greek-American couple and their adopted trio of sons, the youngest of who is Sepro Lucas (who will of course be familiar to veteran Pelenacos readers). It provides fascinating insight into character’s backstory, but doesn’t add anything vital to the Lucas mythos. Despite the lack of action and a real narrative thrust, it’s a highly entertaining sojourn into the past. String Music offers parallel narratives: Tonio Harris, who has made an enemy of some very bad people, and Sergeant Peters who makes it his business to protect the kid. It’s a snapshot of life on the street, revealing the harsh, gritty reality of both sides of the law; essentially, Pelecanos doing what he does best. When You’re Hungry shifts locales, set in Brazil, where an alleged murder victim has been sighted and a crack insurance investigator is dispatched to provide confirmation. Along the way he makes some misinformed alliances, and suddenly this simple job in this apparent paradise takes a darker turn. One of my favourites, Miss Mary’s Room, again sees Pelecanos spotlighting life on the street, and the ruthlessness required to survive. The narrator’s callous attitude towards the intended murder of his friend is chilling; so too his final words. Plastic Paddy, meanwhile, recalls the dangers a group of friends faced while smoking dope in their youth, and how meaningless that time of their lives was. The Dead Their Eyes Implore Us dips into the world of Nick Stefanos (a Pelecanos regular) and stars an immigrant who struggles to build a meaningful life in America; a task made even harder when he takes it upon himself to enact vengeance on the person who killed his friend. 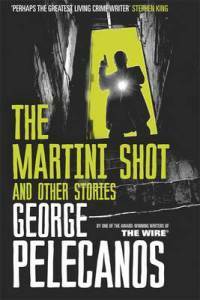 The title novella, The Martini Shot, sees a TV writer / producer, Vic, tracking down the men who killed his gaffer – a drug dealer (albeit an amiable one). Pelecanos clearly utilizes knowledge garnered from his time on The Wire and producing his own independent films, using lingo most of us aren’t be familiar with. It’s a solid story, but is padded in comparison to the other stories, and lacks that special something because of this. The seven short stories, plus novella, are a tour de force from George Pelecanos. For new readers, a satisfactory introduction to his work; for long-time readers, an enjoyable appetizer until his next full-length release.